On tax day, the American Action Forum (@AAF) analyzed the burden of the nation’s broken tax code for individuals. 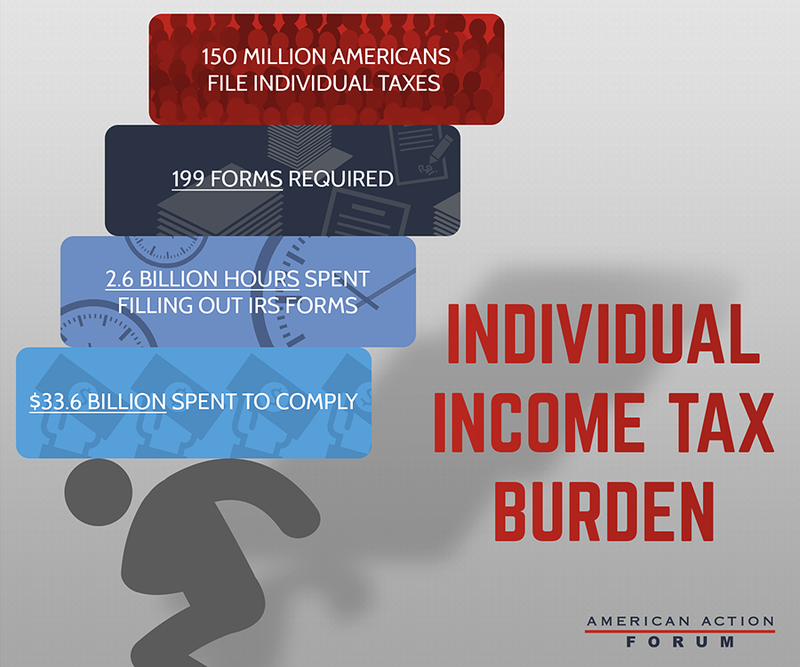 The AAF research finds the individual income tax generates 199 forms, requires Americans spending 2.6 billion hours filling out these forms, and spending $33.6 billion to comply. These figures are staggering for the 150 million Americans that file taxes. The increased burden has corresponded with a declining response rate to inquiries from taxpayers by the IRS. In 2012, the IRS only responded to 68 percent of calls received and 48 percent of letters received. “The tax code is riddled with inefficiency and complexity that confronts taxpayers and the economy as a whole,” conclude Sam Batkins, AAF’s Director of Regulatory Policy and Gordon Gray, AAF’s Director of Fiscal Policy. NOTE: AAF also released an insight on how government spending far exceeds revenues, which can be read here.